Solitary rattan with stem to 12 m tall, without sheaths about 1 cm in diameter, with sheaths to about 2 cm, with internodes about 10 cm in length. Sheaths rather densely armed with dark brown spines of varying length, reflexed or horizontal the longest to 5 cm long by 5 mm wide; spines around leaf sheath mouth erect, very large, to 10 cm long. Knee prominent. Ocrea inconspicuous. Flagellum to about ? 2 m long. 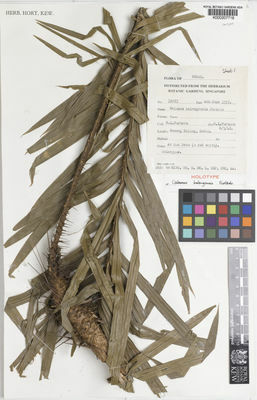 Leaf ecirrate to 2 m long with petiole to 25 cm long, petiole and rachis densely furfuraceous and armed with scattered lateral spines. Leaflets about 50 on each side of the rachis, regular and close the largest to 28 cm by 1.6 wide; the upper surface with scattered bristles on 3 nerves, the lower surface very densely armed with minute bristles. Inflorescence, only male known; to about 2 m long with about 6 partial inflorescences, the longest to 20 cm with all bracts rather densely armed except for those subtending rachillae. Fruit unknown. Seedling unknown. Kedah: endemic. Only known from the type. Slender ? clustering rattan. Stem without sheaths about 7 mm in diameter, with sheaths to 1.1 cm; internodes 8.5 cm long. Sheaths, in dried specimen, dull straw-coloured with scattered dark indumentum and various spines, usually reflexed, scattered, rather sparse, 1-10 mm long. Knee conspicuous with short 2 mm long spines along keel; petiole base unarmed on abaxial face; spines around leaf sheath mouth conspicuous, upward pointing. Ocrea inconspicuous. Flagellum about 60 cm. Leaf to 85 cm long, ecirrate; petiole to 11 cm long, armed with short spines to 2 mm long spaced evenly along the margins; leaflets about 60 on each side of the rachis, narrow, regular, close, the largest to 13 cm long by 1 cm wide; leaflets bristly on 3 nerves above and along margins, and very densely bristly along 5 nerves below. Inflorescence, only female known, to 105 cm long with a long terminal flagellum and three partial inflorescences to about 7 cm long; immature fruit somewhat wider than high, about 5 mm high, 4 mm wide covered in 21 vertical rows of reflexed brownish scales. Perak: known from two collections only. Endemic. Nothing is known of the uses of this species.